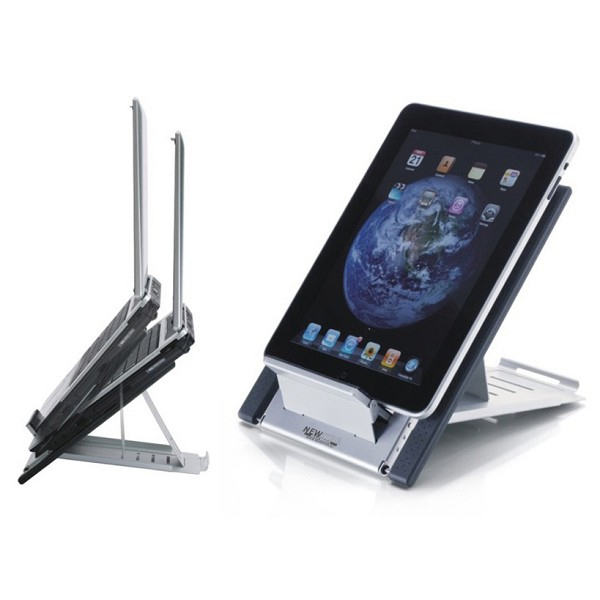 The NewStar universal tablet and notebook stand, model NSLS100 is a universal stand for tablets and notebooks up to 22". It offers six different tilt positions for maximum viewing comfort. Easy to fold flat, light weight and portable. Width adjustable to accommodate most size laptop computers and all tablets. The hollowed-out design avoids over-heating problems for maximum tablet and notebook speed. This stand holds 5 kilo, allows up to 52° angle and offers unique depth measurements of 25cm and stretchable width from 18 to 27cm. The tablet/notebook stand is supplied with a neoprene cover ideal to use as a mouse pad. This model, NS-LS100 is the ideal tool for traveling. Compact, light and easy to carry. By using an ergonomic stand neck- and back complaints can be avoided. Ideal for use in offices and on counters or in a reception area.